Donald Trump may be fiercely against global trade (unless it’s all-American global trade), but he certainly does wonders for world trade in the T-shirt business. Now I don’t believe in buying T-shirts, they’re something you get free with the donor’s trademark, name or whatever printed on the front. Donald Trump T-shirts, however, are impossible to resist and I’ve now got three in my T-shirt drawer and, no doubt, more will join them. Number one was a ‘We will overcomb’ T-shirt which Maureen brought back for me from a US visit, US$14.99 plus sales tax and the T-shirt was made in Honduras. Number two is my Dotard vs Rocket Man T-shirt, an irresistible memento of the Donald Trump vs Kim Jong Un twitter war which the evil little fatman won so decisively. Now that Teezily T-shirt was expensive (A$45.75 = US$37 delivered) and although I was billed in Australian dollars, it arrived from Paris, France (Teezily seems to be based there) and the T-shirt itself was made in Bangladesh. 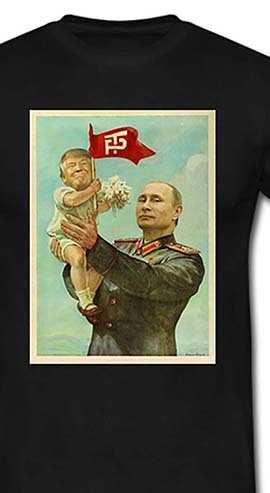 Now I’ve got a bargain priced AliExpress Trump-Putin T-shirt, only US$14.88 including very fast delivery from China, Aliexpress seems to be part of the Chinese Alibaba group, so no surprise there. ◄ But where was the T-shirt itself manufactured? Bangladesh again. So a Chinese company can’t find cheap enough T-shirts in China and has to import them from Bangladesh? Now there’s global trade. Thank you Donald!